»The bathroom spacesaver make full use of the open space above the toilet. 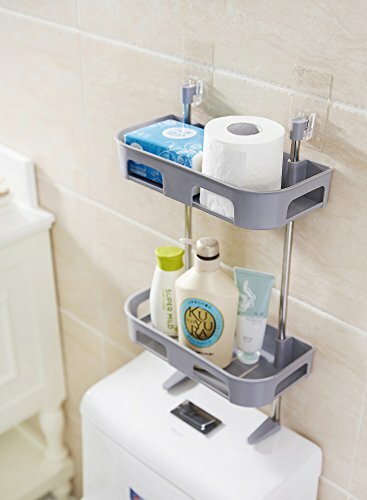 »The Over-the-Toilet Storage Shelf is easy to assemble and fits the standard of toilet tanks. »The material of the toilet rack is safety and environment-friendly which is odorless. »The bathroom shelf is easy to clean, scratch-resistant, good toughness, waterproof and moldproof. Great for any space storage, such as use as bathroom racks, toilet racks, storage shelves. *MULTI-FUNCTION: Besides serves as toilet rack, it is used for spice rack and bathtub bracket. *HIGH QUALITY: It is made of PP non-toxic material, good toughness, easy to clean, scratch resistant, waterproof and mildewproof. *PROFESSIONAL DESIGN: This product adopt professional hollow design, this design can prevent seeper. Moreover, this product can avoid accidental injury with edge round corner design. *EASY TO INSTALL: Double suction cups and stabiliser design. You can easy to install and farewell punching. If you have any questions about this product by Scnvo, contact us by completing and submitting the form below. If you are looking for a specif part number, please include it with your message.